The Parkway Prom was held on Saturday, April 21, 2018 with Retro Country as the theme. Dancing Bowling and food highlighted the fun. The Parkway Panthers held their annual Winter Homecoming Ceremony on Friday Evening, February 2, 2018, when they hosted the Ft. Recovery Indians in basketball action. Crowned Homecoming Queen for the evening was Senior Laura Barrett. Her court included left to right below: Freshman McKenna Schumm; Senior Haley Hawk; Queen Laura; Senior Sydney Crouch; Junior Alyssa Miller and Sophomore Lily Hipply. Queen Laura was crowned by 2017 Queen Klista Hellwarth with the sash placed by Tristen McKee. Click pictures below to enlarge thumbnails. 1st Quarter Honor Roll for Parkway High School - Congratulations! Photos by James Leighner - thanks for sharing! Click on smaller thumbnails to enlarge them! 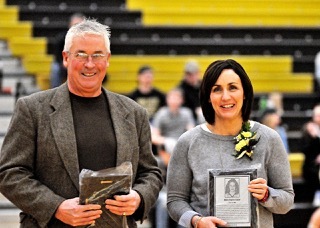 Nikki Taylor Etzler and Fred Morrison were the latest Inductees into the Parkway Athletic Hall of Fame on February 10, 2018 during the JV and Varsity Basketball Games. Nikki earned three varsity letters in volleyball, two varsity letters in basketball and one varsity letter in track. She earned 1st team all-state in volleyball her junior year. During her senior season, Nikki was named the MAC volleyball player of the year and earned honorable mention all-state. She earned first team all-MAC and first team all-district honors in both her junior and senior seasons. During her senior season, she was named the district player of the year. She was a member of two MAC championship teams and regional runner-up teams. Nikki attended the university of Memphis where she earned 1st team all-conference honors her freshman and sophomore seasons. She ranks 4th all-time in assists at Memphis. Fred earned four varsity letters in football and track. He also earned three varsity letters in basketball. In 1977, Fred earned special mention all -state honors, as well as all-Dayton area special mention. Fred was named 1st team all-MAC in football his junior and senior seasons. He earned honorable mention all-MAC his freshman and sophomore seasons. In basketball, Fred was named 1st team all-MAC and 2nd team all-district during his senior season. During his senior year, Fred was named to the District Eight all star team. He was also named to the first team all-Mercer county league his senior season. During his senior season, Fred placed 4th place at the state track meet in the high jump earning all-state honors. He is the Parkway record holder in the high jump, with a jump of 6’7”. Three alumni will be admitted to the Parkway Academic Alumni Hall of Fame Inductees at Parkway High School Senior Awards program on Weds, May 18, 2016 at 7:00 p.m.
Ms. Karen Bollenbacher Casey, Class of 1966, received her Juris Doctor from The Moritz College of Law, The Ohio State University, Doctoral program in Health Education & Counseling at OSU, M. A. in Public Administration from OSU, B.A. in Psychology from Ohio Dominican College, and a Diploma in Nursing from Mount Carmel School of Nursing. Ms. Casey retired after serving for seven years as a CEO for Franklin County Domestic Court & Juvenile Branch in Columbus, Ohio. As Court Director, Ms. Casey was responsible for a 400 employee Court with 5 Judges, managing a $25 M+ budget, a 132 bed juvenile detention center along with developing and coordinating behavioral health and social services for youth and families. Prior to this, Ms. Casey was Court Executive Director for 7 years and Assistant Court Director in Franklin County for 5 years. Earlier in her career, Ms. Casey worked with Community Counseling and mental health agencies for the Franklin County Board of Mental Health. Achievements and Community Involvement are exemplified by service on numerous boards including as a Trustee on the Mount Carmel College of Nursing, the Maryhaven, Inc., and the Alliance for Cooperative Justice, Central Ohio Center for Alcohol Services, Upper Arlington Quality of Life Commission, and Safety Committee Chair for German Village. Past service includes a Moritz Scholar Mentor, Emeritus member of the Moritz College of Law National Council. Ms. Casey is a trustee for a charitable trust to provide monies to support research into chronic childhood diseases at Nationwide Children’s Hospital in Columbus. She works with the Office of Academic Affairs at OSU & the Ohio Scholarship Challenge initiative to raise undergrad scholarship monies for Parkway High School students who attend OSU. Ms. Casey raises funds to send underprivileged elementary students to summer camp for the arts by singing in a community choral group which donates ticket sales to an endowment fund for the children. Mr. James Ripley, Class of 1964, earned a B.A. in Political Science & M.A. in Journalism, both from The Ohio State University. Mr. Ripley retired in 2009, yet served as chair of the Mesa Historical Society from 2010-2011. He led an initiative to recognize his church as a Mesa Historic Landmark. Prior to this, Mr. Ripley was a journalist from 1972-2009. Work experience began as a U.S. Peace Corps Volunteer in Sierra Leone from 1969-1972 helping farmers increase rice yields by turning swamps into fields. He served as a political reporter for the Columbus Citizen-Journal covering John Glenn’s 1974 Senate race, traveling throughout the state with Glenn and his wife. He was an Ohio statehouse reporter for Scripps-Howard News Service which included covering Ohio legislature for three Ohio newspapers, followed by being a state/national political reporter for Dayton Daily News. His first major assignment with the Daily News was covering the blizzard of 1977 by riding on an Army Reserves helicopter to Greenville, OH. Mr. Ripley covered the Rhodes/Celeste gubernatorial race and 1980 presidential primaries in New Hampshire, Illinois, and Ohio. He interviewed many prominent politicians including President Carter, Sen. Ted Kennedy, and covered debates between Ronald Reagan and George H. W. Bush. From 1982-1992, Mr. Ripley was Assistant City Editor, City Editor & Metro Editor, serving nearly ten years in Dayton, OH. Mr. Ripley moved up to managing editor at the Mesa (AZ) Tribune until 2009. Some of Mr. Ripley’s accomplishments include his assignment as lead convention reporter and receiving two first place Ohio AP newspaper awards – one for investigative reporting and one for a series on Ohio prisons while in Dayton. By 2003, the Associated Press Managing Editors Association named Mr. Ripley’s paper, the East Valley Tribune, the best newspaper in the state. In 2009 when Mr. Ripley was the newspaper’s executive editor, a team of his reporters received a Pulitzer Prize for local reporting for a project done in 2008. Mr. Ripley had hired all members of the team as well as the project editor who directly supervised them. Herbert A Schumm, MD, Class of 1978 was awarded a B.S. in Chemistry from Huntington College, M.D. Wright State University School of Medicine, Family Medicine Residency from St. Elizabeth Medical Center, Edgewood, KY.
Dr. Schumm is President of St. Rita’s Professional Services, Lima, OH, since 2012, where he leads and over-sees operations for 23 physician practices. He implemented multiple programs including a professional behavior program for medical staff, PerfectServe messaging and management system, MedMined – an infection prevention tool while Chief Medical Officer for St. Rita’s Health Partners from 2000-2015. Dr. Schumm was honored as a Legend of St. Ritas in 2014. His medical career began with a private Family Medicine Practice from 1989-2000. Dr. Schumm’s community service includes serving as President of West Central Ohio Primary Care Physicians (WCOPCP) – a grass roots organization to bring community-based, private practice primary care physicians together with a common vision to improve patient care and reduce cost with a managed care environment. He is a board member of Cornerstone Alliance Inc. (CAI). CAI is a collaboration between WCOPCP and St. Rita’s which covers a network of 10 counties. Dr. Schumm currently serves on the Lima Area Medical Education Development Board and he served on the West Central Ohio Surgery Endoscopy Center Board for 10 years. He also serves on his church board, teaches and leads small groups, WTLW-Channel 44 Board of Directors, Chairman of the board for Huntington University, and Allen County Port Authority board, along with numerous professional society memberships. Dr. Schumm has taken short term medical mission trips to Honduras, Peru, and Haiti. He and his wife, Paula, have hosted players for Lima Express basketball and Lima Locos baseball team. The goal for the Academic Alumni Hall of Fame is to recognize successful former students, who have contributed to their profession and community while practicing character qualities such as perseverance, self-discipline, curiosity, honesty, responsibility, etc. A committee makes the final selection of no more than three recipients. Criteria are: graduate of Parkway Local Schools (including Willshire, Rockford, Mendon-Union, and Parkway), graduated at least ten years prior to nomination, given time to enhance their profession, and demonstrated leadership, citizenship, and volunteerism. Achievements: Member of Willshire Village Council for eight years, 1964 Charter Member of Willshire Lions Club, former Certified EMT, scoutmaster, Little League coach & corporate sponsor for last 10 years. Former member of Van Wert County Hospital Commission for eight years. In 2006 prepared a photo-documentary of the Willshire School Building. Professionally, Mr. Krall has been Manager of Technical Legislation at Navistar, a member of the NHTSA Motor Vehicle Safety Research Advisory Committee; the Federal Highway Administration; the Society of Automotive Engineers; the National Academy of Science Transportation Research Board; and the Intelligent Transportation Society of America. He received a Distinguished Service Award from the Motor Vehicle Manufacturers Association and a 40-Year Service Award from the Society of Automotive Engineers. Mr. Krall has also authored several publications pertaining to his profession. .Education: BS from OSU in Microbiology; Doctor of Medicine from OSU; Family Medicine Residency at St. Elizabeth Medical Center, Dayton, OH. Professional Achievements: Active member of American Academy of Family Physicians, Ohio State Medical Society, Alpha Omega Alpha Medical Honor Society, Christian Medical & Dental Association; Van Wert County Hospital Chief of Family Medicine, Chief of Obstetrics, Medical Executive Committee, Medical Staff President, and Board of Trustees; Courtesy Staff at Mercer County Community Hospital. Community achievements include Rockford Citizen of the Year in 2010, a member of New Horizons Community Church, Rockford Lions Club, Shanes Crossing Historical Society, Dublin Township Zoning Board, and Rockford Area Development Corporation. Dr. Sell served in the U.S. Army and was awarded the Army Commendation Medal for Meritorious Service. Mission work has included several trips to Honduras and Haiti. Education: U.S. Military Academy, B.S. in Engineering 1967; M.S. in Physics from Purdue University; PH.D. in Nuclear Physics from The Catholic University of America in 1982. Achievements: Dr. Weitz has over 25 years experience conducting applied research in the health physics area. He has been actively involved in the evaluation of radiation detection technologies for potential application to nuclear threat reduction, arms control, and treaty verification. He has worked extensively in the field of nuclear weapons effects on electronics, and has participated in test planning & data analysis activities in support of numerous experimental programs both above ground and underground simulation environments. He has also directed work as a Space Environments Analyst. Earlier in his career, Dr. Weitz served as head of the Radiation Sources Division at AFRRI where he studied the effects of radiation on biological systems and electronics components. Dr. Weitz is a member of the American Physical Society, the Health Physics Society, and he has been published numerous times in refereed journals. The goal for the Academic Alumni Hall of Fame is to recognize successful former students, who have contributed to their profession and community while practicing character qualities such as perseverance, self-discipline, curiosity, honesty, responsibility, etc. A committee made the final selection of no more than three recipients. Criteria are: graduate of Parkway Local Schools (including Willshire, Rockford, Mendon-Union, and Parkway), graduated at least ten years prior to nomination, given time to enhance their profession, and demonstrated leadership, citizenship, and volunteerism. Achievements: 1997 – Franciscan Spirit Award from St. Francis for Community service, 1998 “Tribute to Women of Achievement” from YWCA, 2005 Distinguished Alumni/Alumni Hall of Fame from St. Francis, 2008 awarded “Star Financial Business Leadership Award” by Taylor University & “Citizen of the Year” by Fort Wayne Journal Gazette, 2009 “Distinguished Hoosier Award” by Gov. Daniels, 2011 presented the “Key to the City of Fort Wayne” by Mayor Henry. Achievements: Board member of National Association of Professional Lines Organization, Board member & Treasurer of NAPSLO Education Foundation, Board member and Chair of Board of Trustees for the Scottsdale Cultural Council, one of the founders of the Scottsdale Forward Movement in the City of Scottsdale. Board of Trustees of the Defiance College, Chair of Board of Trustees of the Winebrenner Theological Seminary. Past member of board of Grand Canyon Chapter of the American Red Cross. 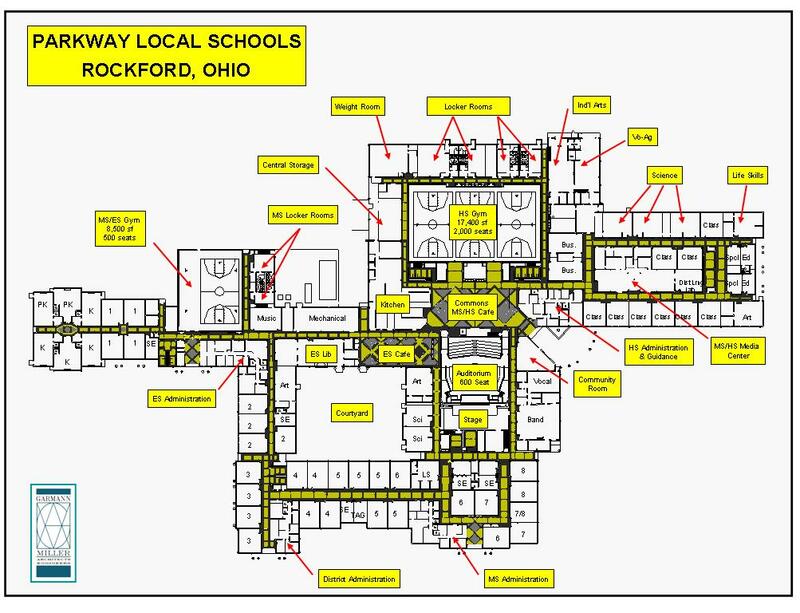 Scottsdale Boys & Girls Clubs, YMCA, Chamber of Commerce, & Meals on Wheels in Columbus, OH, and past member of the Parkway Board of Education. Current Employment: Vice President – Environmental, Health & Safety & Operational Sustainability for Owens Corning in Monclova, Ohio. Education: B.S. in Business Admin with Accounting major in 1979 from Miami University. Achievements: Currently serving on the Executive Board of the Regional Growth Partnership focused on economic development in NW Ohio, Executive board member of the Jamie Farr Toledo Classic golf tournament which benefits children focused charities in NW Ohio and serving as a World Class Team Member and Campbell Institute Advisory Board Member. Professional organizations include National Accounting Association, American Production & Inventory Control Society, National Safety Council, the Corporate Environmental, Health & Safety Roundtable. Community involvement includes Lions Club, church boards and committees, Junior Achievement, supporting the United Way as a Cabinet Campaign Member.